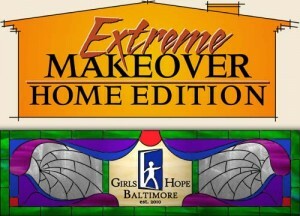 Watch the season premiere of Extreme Makeover Home Edition this Sunday (Sept. 26, at 7pm | 6c), and see glass from SGO Designer Glass in Baltimore! Plus, our local ABC affiliate, WMAR-TV, will be broadcasting an hour long special at 6pm, highlighting the Baltimore setting of the show. We helped the makeover team in their remodeling of Baltimore Girls Hope by providing this transom for their entryway, as well as the glass for a “chan-DOOR-lier .” Watch the shows and check it out for yourself! We’ll be posting clips on our Media page and our YouTube Channel once it’s made available.